I was at work in Bergenfield, and on this particular day, feeling depressed. One of my nurses came into my cubicle and said, "Dave, you need some cheering up. I bought some scratch-offs, why don't to take one for free." 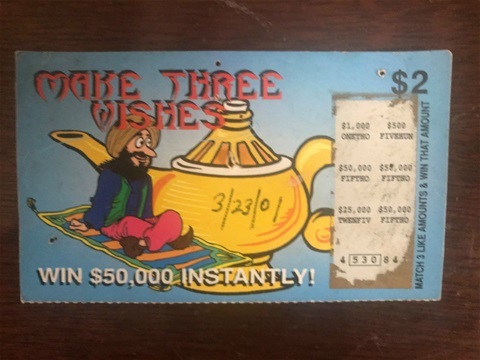 As I slowly scratched the ticket, my eyes couldn't believe it for I had won $50,000! My mind was racing with thoughts of paying for my children's college loans and more. I stood up and screamed, "I WON THE LOTTERY!" I ran out of the office waving the ticket over my head. I thought I heard the nurse say "Wait," but in my joy ran to share it with everyone. I ran through the Bergenfield Borough Hall, into every office on all THREE floors (basement, ground level, and second floor) waving my ticket and screaming about my good luck (police, tax records, court, administration, building dept, fire, payroll). Finally, I returned to my office, and I kid you not, lept onto the customer counter, and started dancing on it waving the ticket over my head. Then, I looked around the room, but it looked empty. I was able to see into the Health Inspector's cubicle and it looked liked he had his head on his desk. Everyone else was hiding. I slowly lowered my ticket and said, "Please don't tell me this is a prank." At that point the nurse came over from her office. She looked a little distraught. She said, "I am so sorry, I tried to stop you." Has anyone out there ever gone from a feeling of complete elation to one of complete devastation in a matter of 3 seconds? That's how I felt as I slowly climbed down from the counter.